If we were able to see the lines of longitude and latitude on the surface of the sun, they would appear to wobble as we orbit the sun during the year. This is because the orbital plain of the Earth is not exactly aligned with the equator of the sun. If you want to track the location of sunspots over long periods of time, it is important to know how much the sun is tilted in relationship to our line of sight from Earth. The Stonyhurst discs allow us to do this. There is a different disc for each month of the year. If you use the correct disc and align it properly on your Sunspotter image, you can more accurately describe the location of sunspots over time. The link below takes you to an animation of how the lines of longitude and latitude appear to wobble as we orbit the sun. The first step is to download the Stonyhurst grids and choose the correct B0 (BZero) grid. (See Linahan Project 2 below). Notice that the B0 1 grid and the B0 -1 grid are the same grid oriented in the opposite direction. Orient the disc you need so that the number you need is in the north position. To draw a reference line, you need to track a sunspot for about a minute. Place a blank piece of paper on the Sunspotter. Track a sunspot and mark it on the paper approximately ever 5-10 seconds until four marks have been completed. This represents the direction to the West. This is the East-West reference line.On the Stonyhurst disk, East and West are the opposite. East is on the left perpendicular to North and west is on the right perpendicular to North. Be sure to orient your B0 grid with the correct number in the north position. Once you have the correct Stonyhurst disc ready to use, you have to give it a little twist to orient it correctly on your Sunspotter. 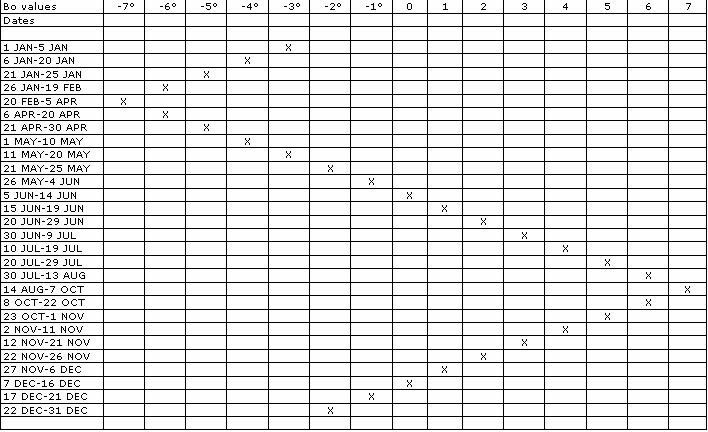 The chart tells you the degree angle from North/South to rotate the Stonyhurst disc. Positive values - rotate clockwise. Negative values - rotate counter clockwise.